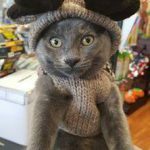 I was adopted! 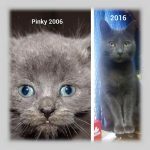 Little John came to Fixed Fur Life as a stray kitten. Very outgoing, cuddly boy! Presently at the Trenton Pet Valu for adoption. Ebony and Ivory were adopted together! 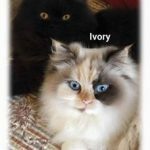 Ebony and Ivory are 18 month old bonded Himalayan Spayed sisters surrendered to Fixed Fur Life as the result of a relationship break up. Really sweet girls! 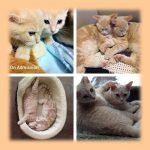 MUST be adopted together. Arianna's owners moved away and left her and her kittens behind in an apartment. Kittens have all been adopted. 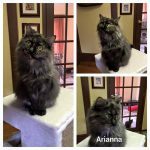 Arianna was spayed by Fixed Fur Life and has now gone onto her new home! These updates make my day. 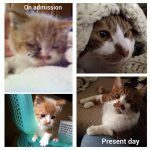 Many years ago we rescued a wee little girl who was living in a shed. On admission we noted that she had a neurological issue and her balance was off. 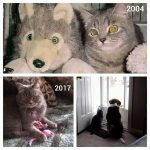 Seems like just yesterday but I remember putting this stuffed wolf with her so she didn't feel lonely. Muffin now Phoebe was eventually adopted. Here is an update 13 years later!!! A year ago today I was surprise with a late family Valentine gift. This shy little cat formerly named Louis. His owner from my understanding was a disabled lady loved him dearly but had to go into a home which would not allowed her to bring her dear pet. Being an older cat he was not scooped up. 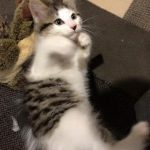 But our family feel in love with him and adopted him through "Fixed Fur Life". We gave him the name "Miles" which suited him fine because he puts on a lot of miles in our house. 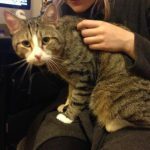 In one year Miles has become less of a scaredy cat and more of a curious cat. He sleeps every night with my husband and I in the bed and taunts the dog. He sleeps on my lap when I am up and my chest for early morning snuggles. He love to show affection and to receive love and affection from us. My youngest chases him around the house and Miles chases him in return. He truly has become a wonderful part of our family. We couldn't be more blessed then we are to have him in our lives. 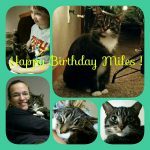 Happy Birthday Miles....1 year in our house and 3 years of age. We all love you! Just love getting updates from our Alumni. 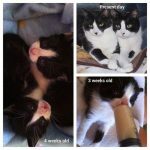 We rescued Pinky and her litter mates who had been born outside in an old abandoned stove. All had to be bottle fed all all did really well and were eventually adopted. I remember the night she was picked up from my home for adoption. This picture is 11 years later taken this past Dec. Thank you Jane for the update! 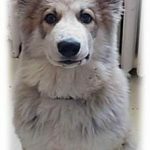 Lexi's owner could no longer care for. She has now been adopted and Spayed. She is loving her new brother Jack also an FFL Alumni. My girl Kahleesi (formerly called Mischa), came to Pet Valu In Trenton at 8 weeks old for adoption from Fixed Fur Life. I saw her and immediately knew I had to have her. She is now celebrating her 1st birthday today, and she's living a happy, healthy life. I love her to pieces. Thank you so much for all you do & bringing my girl into my life! 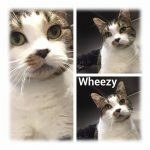 Wheezy came to us many months ago un spayed and suffering from an upper respiratory infection. She was Spayed and has now finally been adopted. 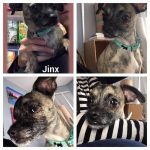 Little Jinx's owner had a terminal illness and could no longer care for. She tearfully asked Fixed Fur Life to help re home him. We found him a wonderful home and he is now running and playing happily with his 2 new canine sisters! He adjusted beautifully in his new home! 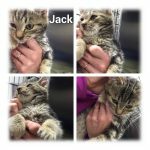 Jack came to us as a wee stray kitten. He was treated for an upper respiratory infection, worms, fleas and ear mites. He has now been adopted! Blossom is just one of many kittens who come our way. Shown here modeling her Christmas antlers just prior to being adopted! 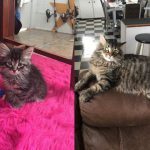 So many beautiful updates came our way over Christmas Sudz and Bubbles came to us a few years ago after being found in the Car wash at Canadian Tire. Just 3 weeks old they needed bottle feeding. We received a present day update and it made my day! 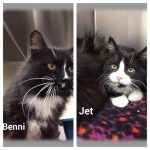 Bennie and Jet are a mother and son duo. They were living outside and momma had her baby outside in the cold. 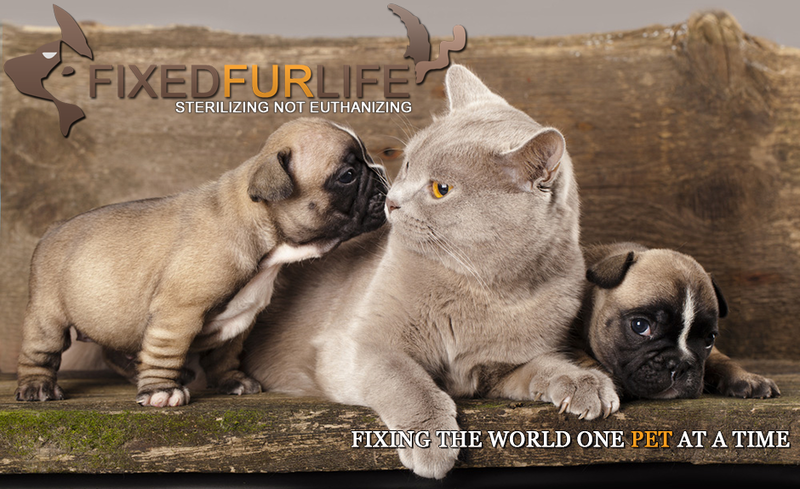 They came to Fixed Fur Life, were Spayed/Neutered and have since been adopted! 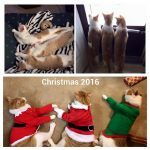 Many years ago we adopted 3 brothers together and every so often we receive updates. The boys are always together. The latest update was taken this past Christmas! 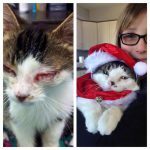 Aidan came to us a last year with a severe eye infection. It took us many months to treat it after which he was neutered and adopted. Shown here this past Christmas 2016! Love getting updates. This little guy came our way a couple of years ago. Really ill and malnourished. We spent months getting him on his feet and finally adopted. Shown here present day. 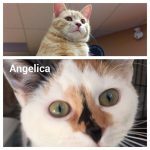 Angelica and Barney are 2 of 9 kittens that came to Fixed Fur Life as owner could not care for. All 9 were Spayed and neutered and have now all been adopted!